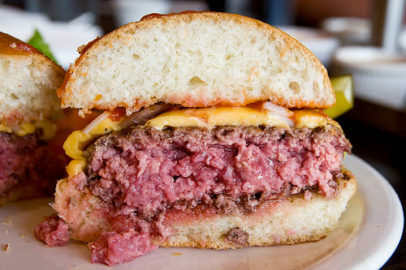 I love rare & medium rare burgers and this is also the way most good burger joints recommend how their burgers are served; seared on the outside and soft & tender on the inside, mmmm. And as long as these establishments are cooking these in the right way, with meat from the right suppliers (although with recent issues with a few big name meat suppliers recently, this is no guarantee) then all is good. Cooking burgers with any pink in the middle at home, however, is a big no-no, at least according to Food Standard Agency (FSA) guidelines! The reasons for this require a bit of background. When meat is produced (slaughtered & prepared), there is the potential for contamination of bacteria from the animal’s gut & hide on the outside of the meat. If the meat is then minced, any contamination from bacteria such as e.coli on the outside is then mixed and spread throughout the mince. This is the same reason why it’s fine to serve rare steak from home, as any potential contamination (which is on the outside of the steak) will be annihilated via the searing of the meat on the griddle, pan or BBQ. Meat sourced from an approved FSA supplier who is approved to supply mince which is intended to be served raw or pink (basically having safe levels of pathogens/bacteria). Evidence of a demonstrated and tested method of cooking & serving the mince in the safest manner (based on accurate measurements of temperature & cooking times). Typically, minced meat bought from supermarkets & butchers will not have the same level of strict controls that restaurants need to put in place to serve less than fully cooked mince. So, serving rare or medium rare burgers at home made from shop or butcher bought mince could be setting yourself up for a big fall (or at least a long sit down on the porcelain throne!). It’s also worth remembering that any restaurant with a low food hygiene rating and serving raw or pink mince should most likely be avoided.